The Principles for Responsible Banking provide the much-needed framework for the sustainable banking system of the future – and enable the banking industry to demonstrate how it makes a positive contribution to society. They are designed to guide any bank – whatever its starting point – to align its business strategy with society’s goals. 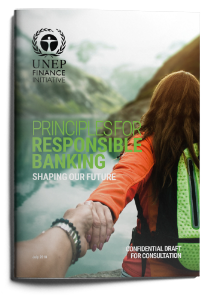 Developed by 28 banks from five countries, the Principles for Responsible Banking are currently being reviewed in an open global consultation process running until 31 May 2019, prior to their official launch in September 2019. Find out more about Principles for Responsible Banking here.